At 12:30 p.m. on this this rainy and blustery day in 1941, standing before a joint ses­sion of the U.S. Con­gress and a world listening by radio, the 32nd Presi­dent of the United States, Franklin D. Roose­velt, laid seve­ral type­written sheets on the speaker’s podium. The day before, the presi­dent had calmly and deci­sively dic­tated to his sec­re­tary a draft request to Con­gress for a decla­ra­tion of war against the Empire of Japan. He had com­posed the speech in his head after deciding on a brief, un­com­pli­cated appeal to the peo­ple of the United States rather than a thorough recita­tion of Japa­nese per­fidies leading up to their savage attack on the unsus­pecting U.S. Pacific Fleet anchored at Pearl Harbor, Hawaii. Roosevelt pencil-edited his reading copy, making the most signi­fi­cant change in the opening line. 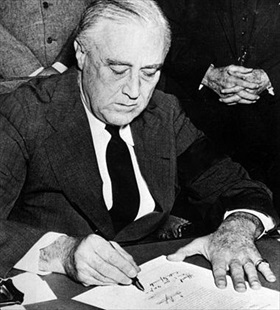 “Yester­day, Decem­ber 7, 1941,” the presi­dent in­toned in his seven-minute address to members of Congress, was “a date which will live in in­famy.” Less than an hour after FDR’s speech, which was followed by five minutes of applause, shouting, and foot stamping, Con­gress passed a for­mal decla­ra­tion of war against Japan and officially brought the U.S. into World War II. That same day the presi­dent wrote to British Prime Minis­ter Winston Chur­chill, telling him that the two nations were in the “same boat” now, “a ship which will not and can­not be sunk.” Also on that day Brit­ain declared war on Japan, followed within three days by at least eight more nations. 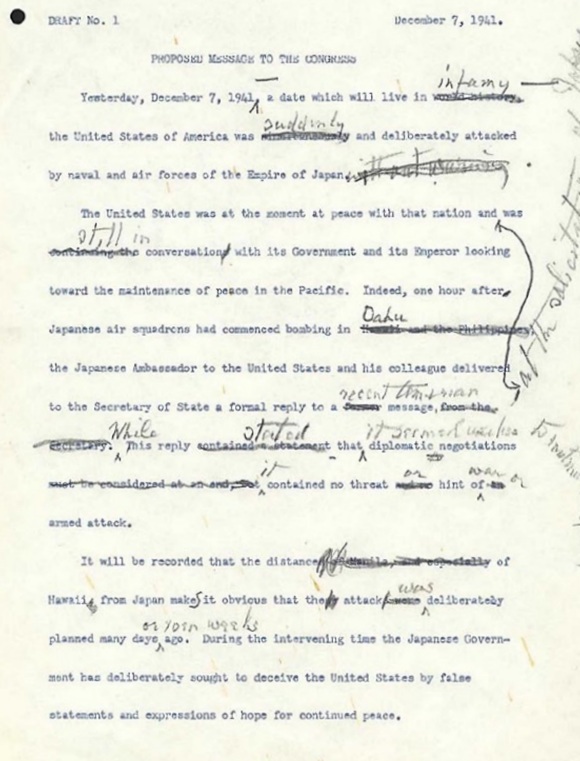 Above: Page 1 of President Roosevelt’s changes to his first draft of the “Day of Infamy” speech delivered to the U.S. Con­gress on Decem­ber 8, 1941. The five hundred word address is regarded as one of the most famous American political speeches of the 20th century. 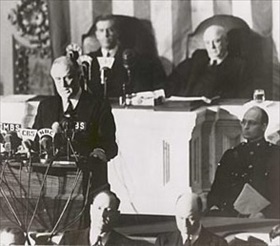 Left: President Roosevelt delivers his “Day of Infamy” speech to mem­bers and guests of the U.S. Congress, Decem­ber 8, 1941. Behind him are Vice President Henry Wal­lace (left) and Speaker of the House Sam Ray­burn. To the right, in military uni­form in front of Ray­burn, is Roose­velt’s son James, who escorted his father to the Capitol. Only one mem­ber of Congress, a life-long pacifist from Mon­tana, voted against the declara­tion of war. The anti-war and isola­tionist move­ment that had cam­paigned so strongly against Amer­ican involve­ment in the war in Europe, begun in Septem­ber 1939, collapsed almost imme­di­ately on the day Adolf Hitler’s and Benito Musso­lini’s Axis partner, Japan, launched a pre­emptive strike on U.S. facilities at Pearl Harbor, Hawaii.